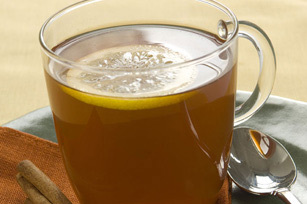 Discover our cold-weather version of iced tea: Hot Spiced Tea. Our Healthy Living Hot Spiced Tea gets its bold flavor from ground cinnamon and cloves. Mix all ingredients. Store in tightly covered jar at room temperature. Add 1 qt. (4 cups) boiling water to 1 Tbsp. tea mix in heatproof pitcher or bowl; stir until mix is dissolved. Add 1 cup boiling water to 3/4 tsp. tea mix in mug; stir until mix is dissolved. Serve with lemon slices and cinnamon sticks, if desired. Prepare using CRYSTAL LIGHT Peach Flavor Iced Tea Drink Mix.